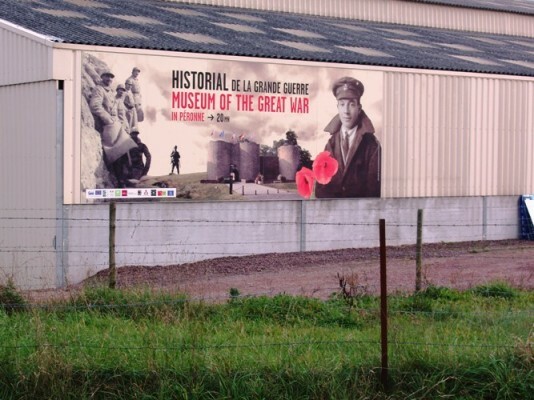 Historial de la Grande Guerre, Peronne – big advertising! I was at the Historial yesterday and am always impressed with the place. The Gas! Gas! Gas! Chemical Warfare exhibition is well worth a look and was very well done (it ends on 14 November). Let’s hope that the sign encourages some battlefield visitors to visit Peronne. I understand Thiepval Visitor Centre and the memorial gets about 150,000 visitors per annum and the Historial just over half of that. Those tens of thousands don’t know what they are missing – the museum really is top class and is only a hop and a skip from the British 1916 battle areas. Click HERE for the Historial’s website.